Altar of the Sun is also known as the Temple of the Sun and is an altar located in Chaoyang District, Beijing, China. Built in 1530 the place has today become a good spot for tourists due to its appealing architecture and scenic location. The temple is a great place to while away some time in the city as it offers peace and serenity. 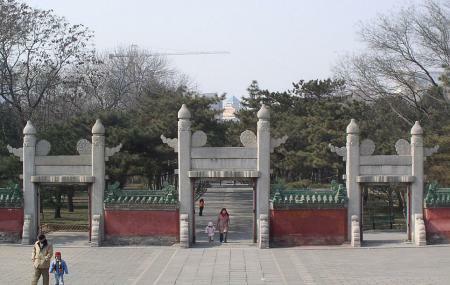 The temple is within Ritan Park, in the Jianguomen area. Take a bus from Ritan Park. How popular is Altar Of The Sun? People normally club together Big Bell Temple and Li Qun Roast Duck Restaurant while planning their visit to Altar Of The Sun. Seems to be a popular place for the local Beijing residents to go for a walk in the park. Free of charge to enter. When walking west to east, Google maps leads you down a somewhat deserted pathway (so initially a bit disconcerting) towards an eastern exit that was a bit of a surprise - a broken down door that you could step thru to successfully exit to the roadway. But I guess that was better than running into a locked door (dead-end). My favorite place to walk around when we are in Beijing. A wonderful non tourist spot. A must go, there is always something going on. Lovely park with great scenery and people dancing and playing games. There are many places to sit in the shade and relax and some beautiful art pieces. I was told the park is dedicated to the story of how there were 9 suns and a hero shot all down but one in order to help the people on earth who were too hot. We went here in Feb 2016, It is a magical place. We went very early in the morning it was very cold. We saw people exercising by doing various martial arts and using the gym equipment in the park. The temple is an amazing structure. There were other things of interest around the park with information plaques. The park is open 24hrs and is free of charge. If this review was helpful, please like.